Many of you must have come across the term ‘soy lecithin’ on various food labels. It plays a crucial role as an antioxidant, flavor protector and an emulsifier. It breaks down fat into smaller particles and makes it easier to digest. Besides this, it provides a smooth texture and appearance to the final product. Currently, an array of research studies are being carried out on the benefits of soy lecithin on human health. But as every substance has a good and a bad side, soy lecithin also has certain side effects. Side effects of Soy Lecithin include gastrointestinal problems, changes in weight, Skin Problems, low blood pressure, respiratory troubles, etc. In most cases, these side effects appear when it is taken in high dosage. It can cause abdominal cramps, diarrhea or loose stools, stomach pain, nausea, etc. Generally, these side effects of soy lecithin start appearing on digestive system when you take it in higher dosage. Some individuals have experienced weight gain after the consumption of soy whereas, some have observed loss of body weight. Weight loss may be caused because soy lecithin suppresses the appetite and thus, it reduces food intake and entry of overall calories into the system. However, more studies are required to understand the impact of soy lecithin intake on body weight changes. However, such problem may occur if an excess of soy lecithin has been consumed for a prolonged period of time. Low blood pressure is as risky as high blood pressure. Such a condition may be a result of excess consumption of soy lecithin. Besides this, confusion, dizziness, lightheadedness, blurred vision, and headache are some other side effects of soy lecithin. Because soy lecithin is genetically modified, it may be unfit for human consumption. Genetically modified soy lecithin is more dangerous to our health. 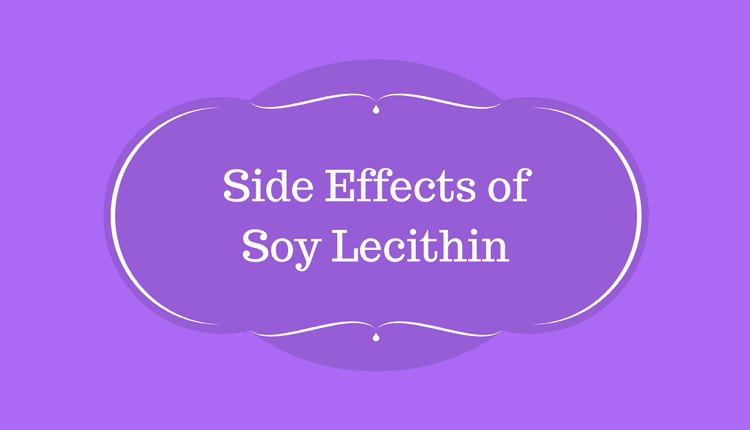 Note: Do not consume soy lecithin when pregnant or breastfeeding. Consult your doctor before using it.